Do they really expect us to believe this wasn’t arson? The New York fire department has dispatched dozens of units and over 120 firefighters to tackle a four-alarm blaze that erupted on the 50th floor of Trump Tower in Manhattan. One person has died after suffering serious injuries in the blaze, while four firefighters received non-life-threatening injuries, the New York City fire department said. FDNY crews were called to the 50th floor of the building on Fifth Avenue shortly before 6pm Saturday. Thirty-six units and 126 firefighters responded to the four-alarm fire. People have been evacuated from the building. The extent and the severity of the fire was not immediately clear. “Smoke and debris,” one eyewitness wrote next to his video post of the fire, which shows smoke rising above Manhattan. “Fire dept throwing anti-flame powder. Seems controlled, though with semi-extensive damage to floor and at least three offices,” Michael Lukiman noted. “Firemen (and women) did a great job. THANK YOU!” Trump tweeted. 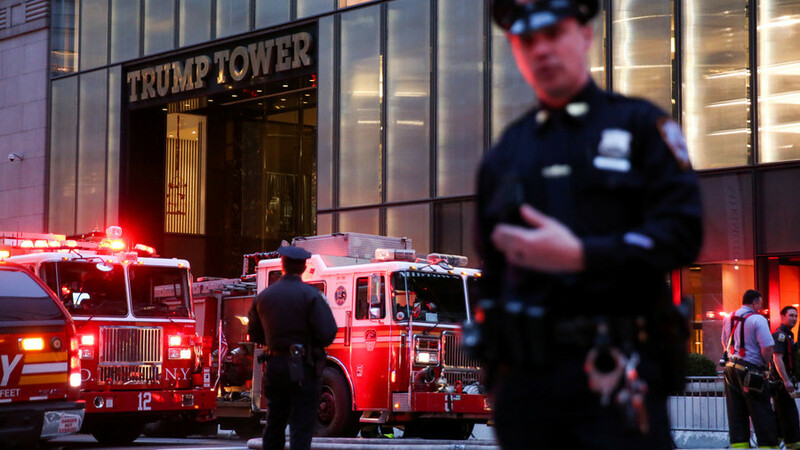 Saturday’s fire at Trump Tower follows an incident three months ago, when a minor fire broke out in a cooling tower on the roof of the building. In the January 8 incident, two people were treated for minor injuries.